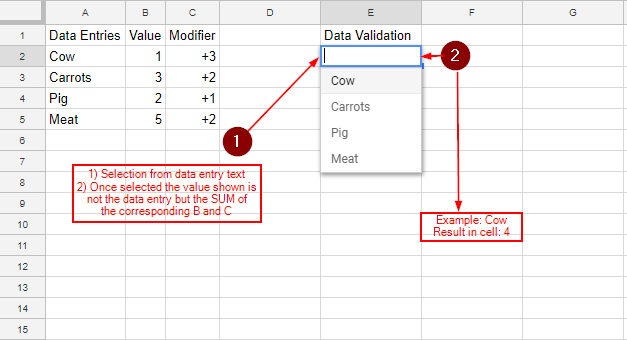 In google spreadsheets you can include a custom formula for data validation, which made me wonder if this could be used to calculate inside of the cell that you make a selection from. So let's say we have Column A which lists various names. Then we have Column B which list corresponding values to the data in A. In Column C there are various modifiers to the values in Column B. My question is, can I create a data validation drop down list with the entries of column A, but once selected, the data shown is not the text from Column A, but instead the corresponding SUM of B and C? I can imagine something like this might be doable with scripts. However, I would prefer using google's spreadsheet formulas as the data validation popup provides the option to use a custom formula for the range provided. If that's impossible, some hints or leads regarding scripts work as well. You could use a script created using Google Apps Script and on edit trigger to replace the selected value from the drop-down list by the desired value. C1 has a data validation to use A1:A3 as the list of valid values. Once a value is selected on the dropdownlist on C1, the following script automatically will replace A by 1, B by 2 and C by 3.